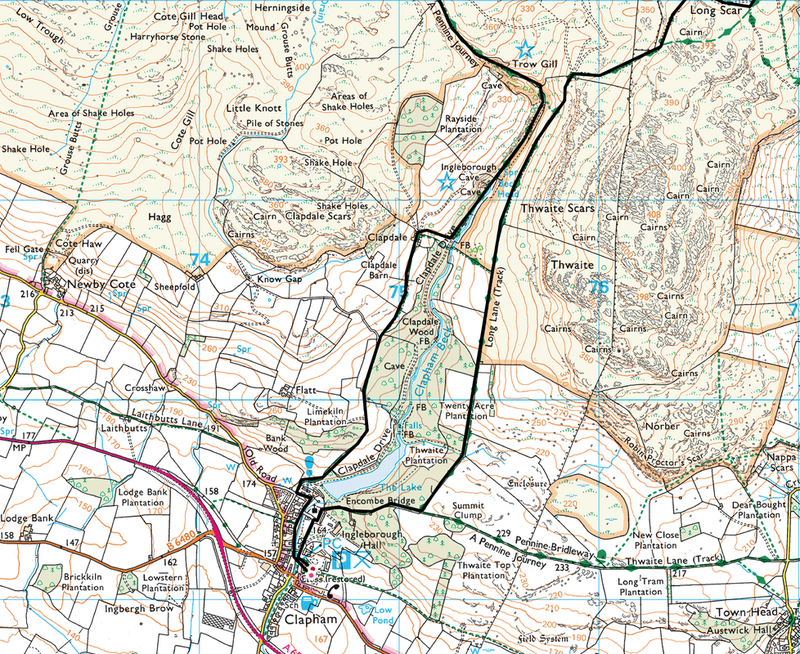 Good paths throughout. 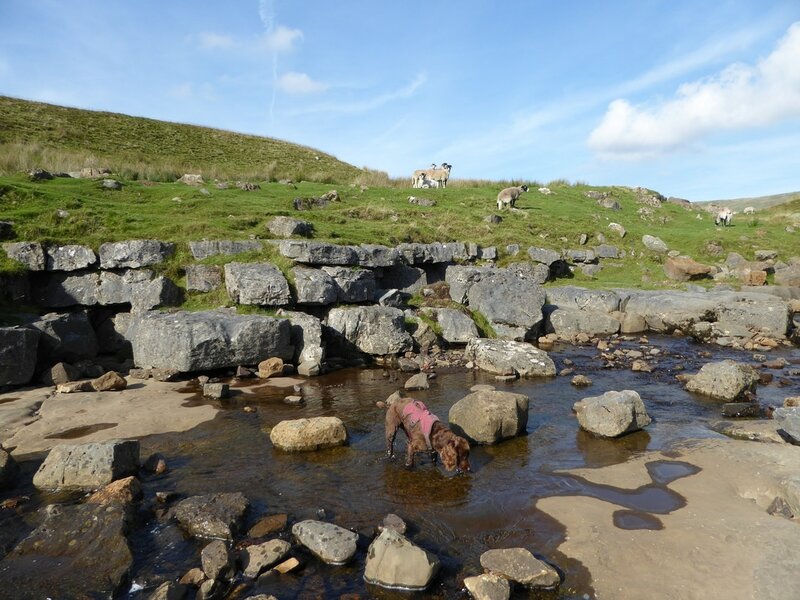 There is some loose stone scrambling up Trow Gill but nothing too onerous. 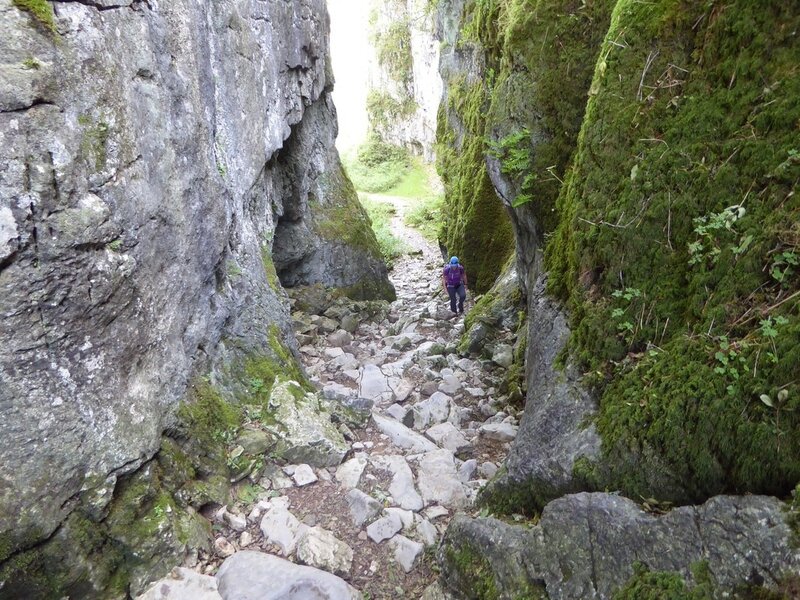 Care should be taken in and around the deep chasm of Gaping Gill. 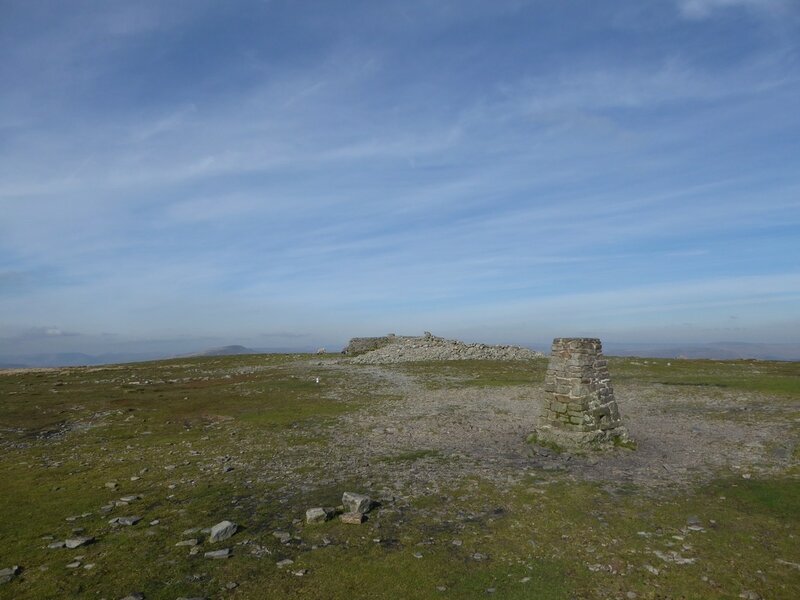 Mild & sunny with excellent visibility. 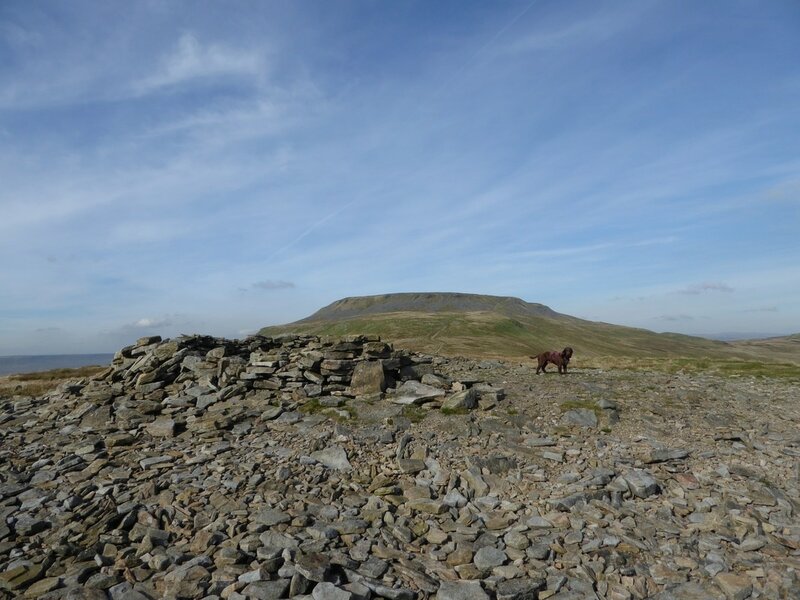 At 2372ft (723m), Ingleborough is the second highest summit in the Yorkshire Dales behind Whernside. 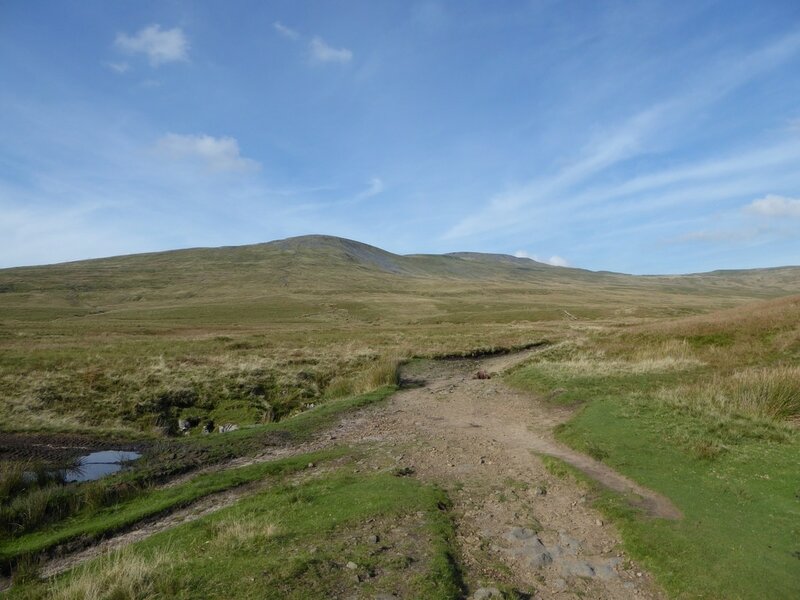 It is part of the famous Yorkshire 3 Peaks Challenge and if the route is done anti-clockwise, Ingleborough is the last peak climbed. 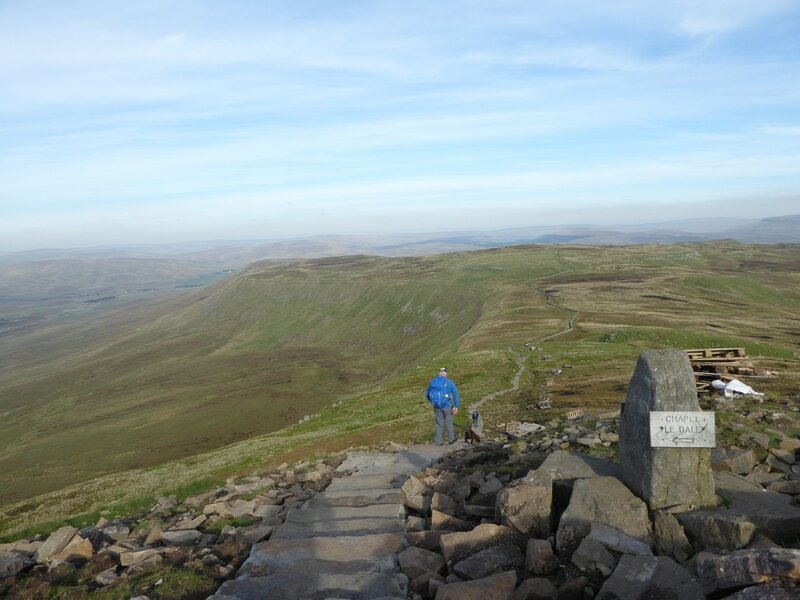 There are several popular routes up to the summit and today’s way is our favourite - starting from Clapham and making the ascent via Trow Gill & Gaping Gill. 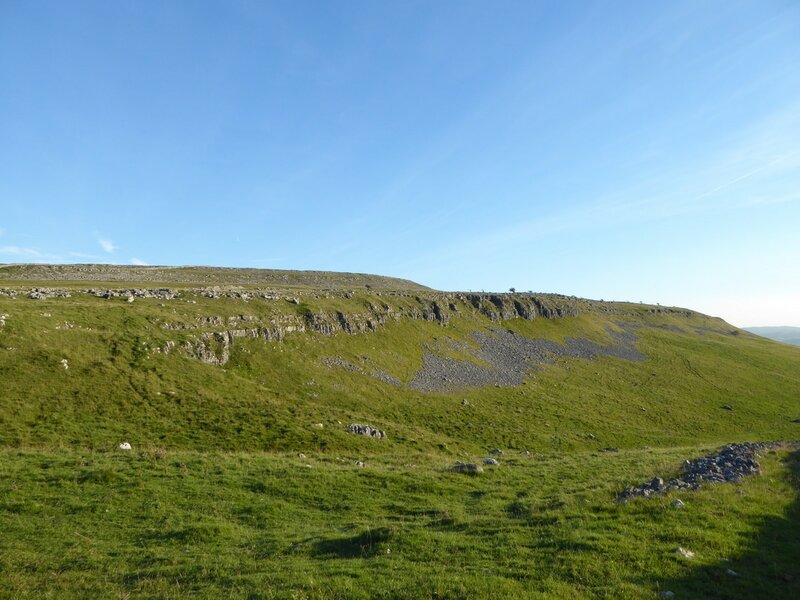 Our descent would see us pay a visit to Simon Fell before making our way back to Clapham via Long Scar. 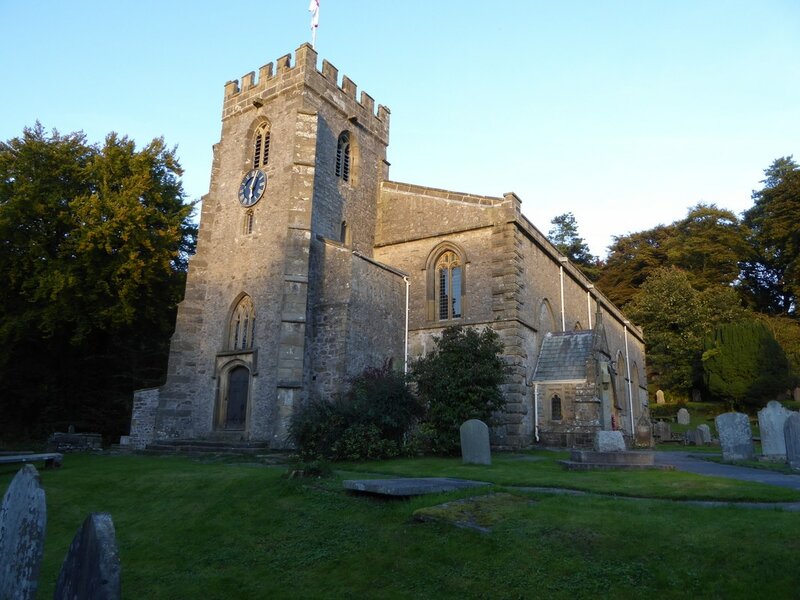 Clapham is 6 miles north west of Settle and just off the A65. 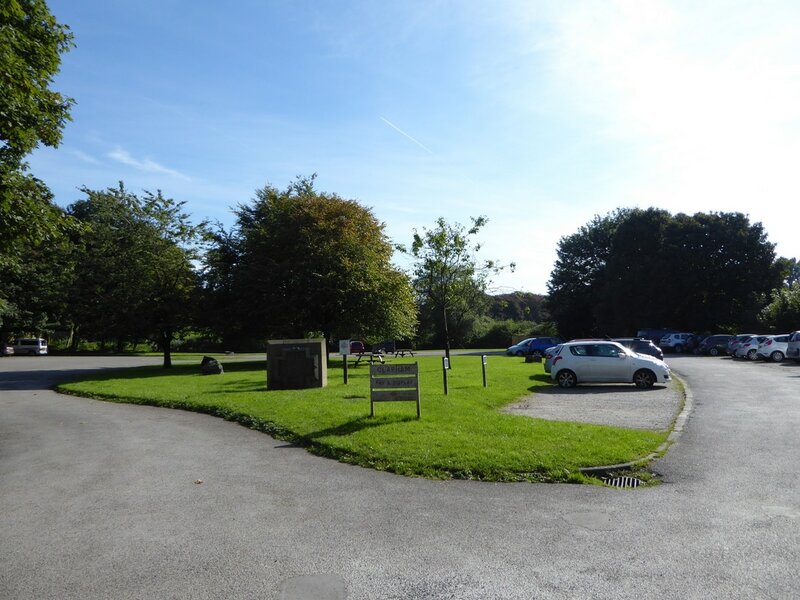 There is a large Pay & Display Car Park in the village although for those that are fiscally aware there are free spaces to be had in and around the streets & lanes. 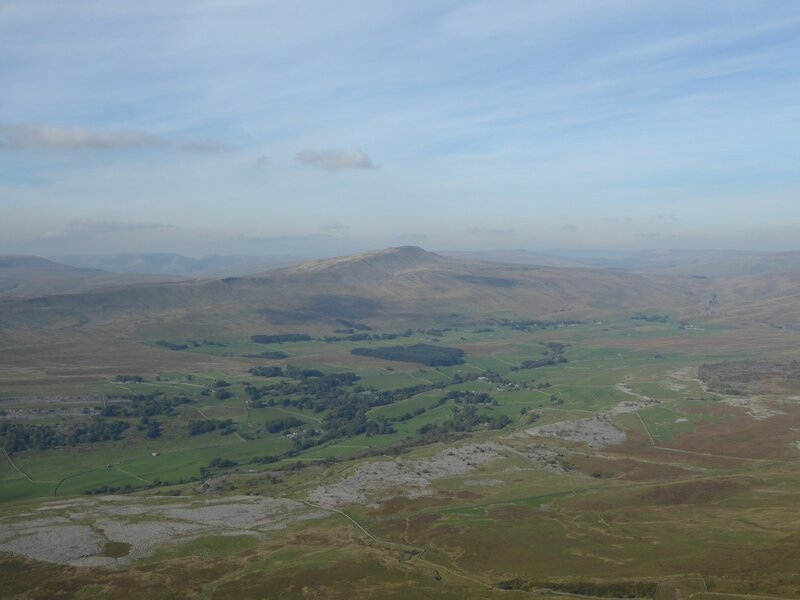 We did not start the walk until midday and hoped to be up on Ingleborough's summit when it was a bit quieter. 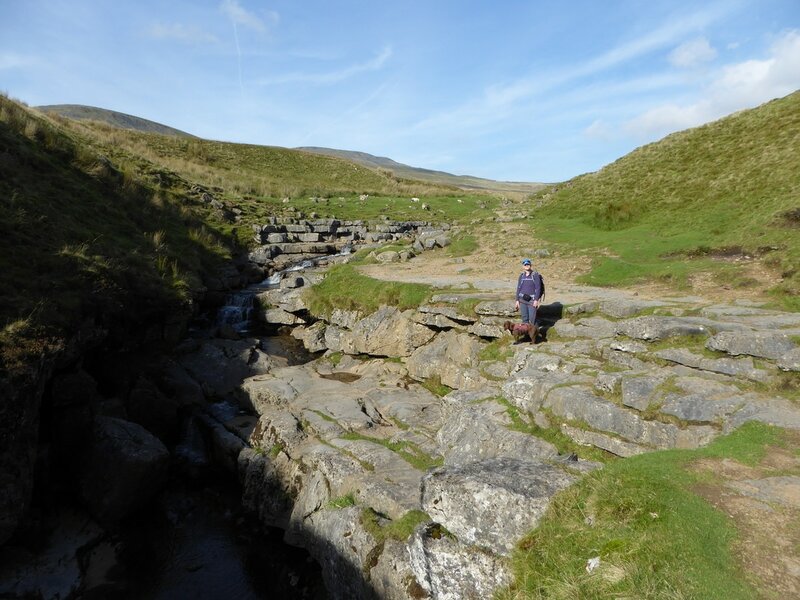 Leaving Clapham, we crossed the beck of the same name to reach a Bridleway where a sign pointed to Ingleborough Cave & Gaping Gill. 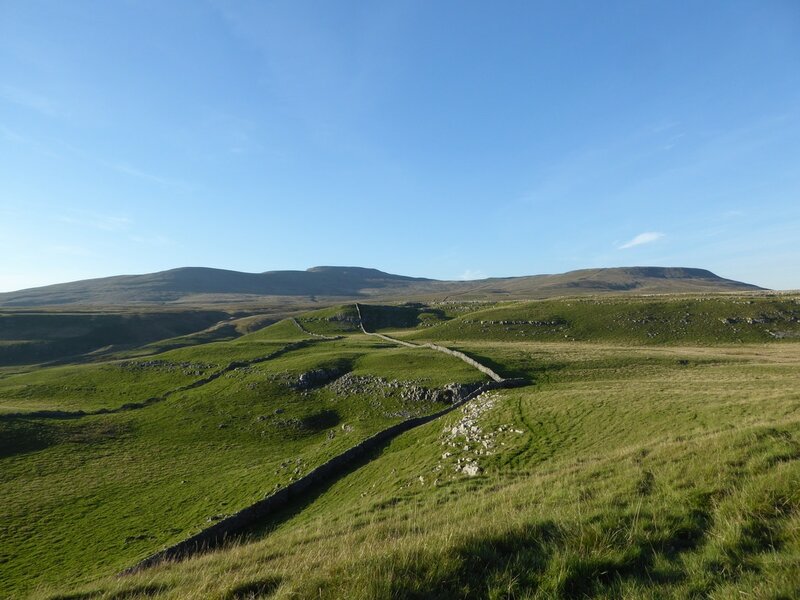 The track rises very gently to reach the farm at Clapdale before dropping steeply to reach the access track to Ingleborough Cave. 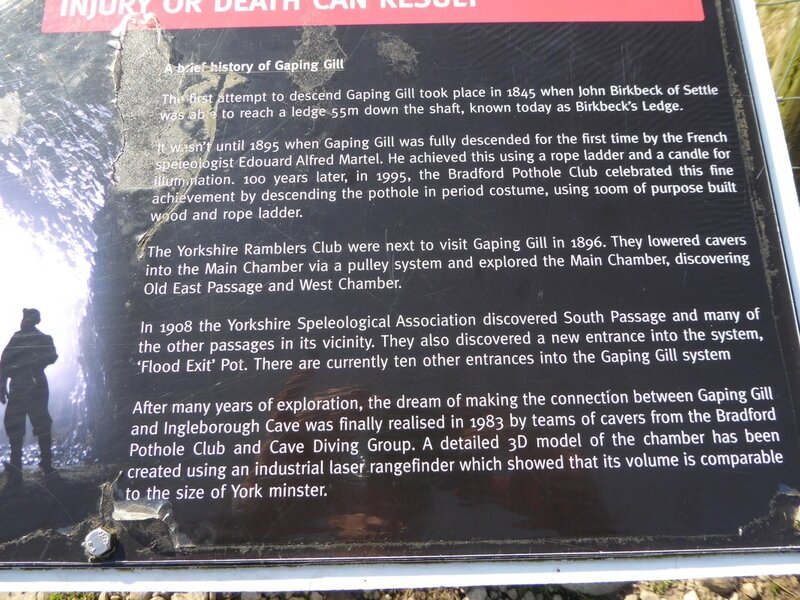 The cave was first entered and made accessible in 1837 and is the premier show cave in the Yorkshire Dales. 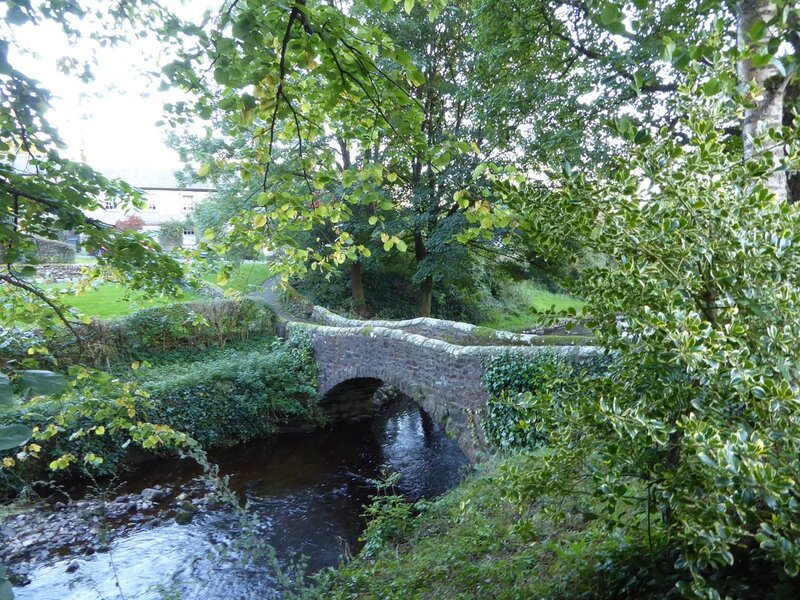 In 2012, it celebrated 175 years of entrancing visitors with an awe inspiring range of stunning cave formations. 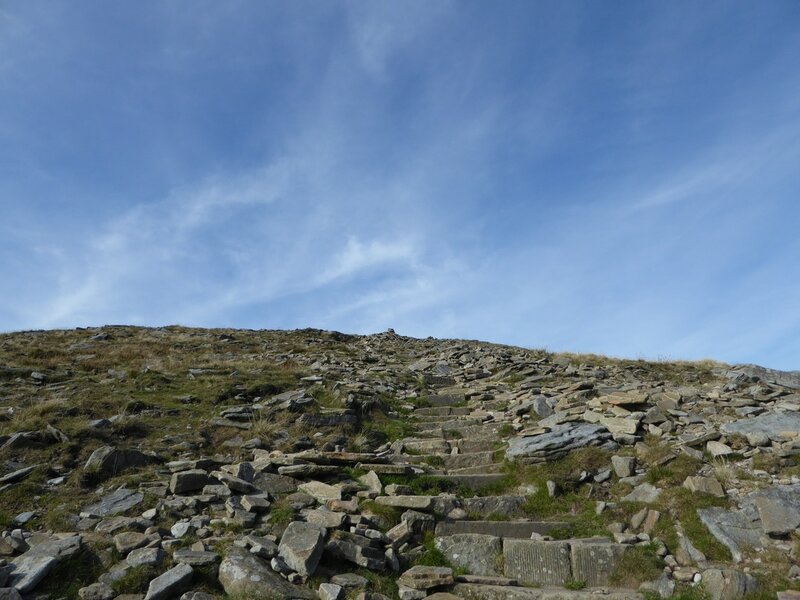 The imposing cave entrance and the large passages are full of artefacts dating back millions of years along with the evidence of the significant impact of the Ice Ages. 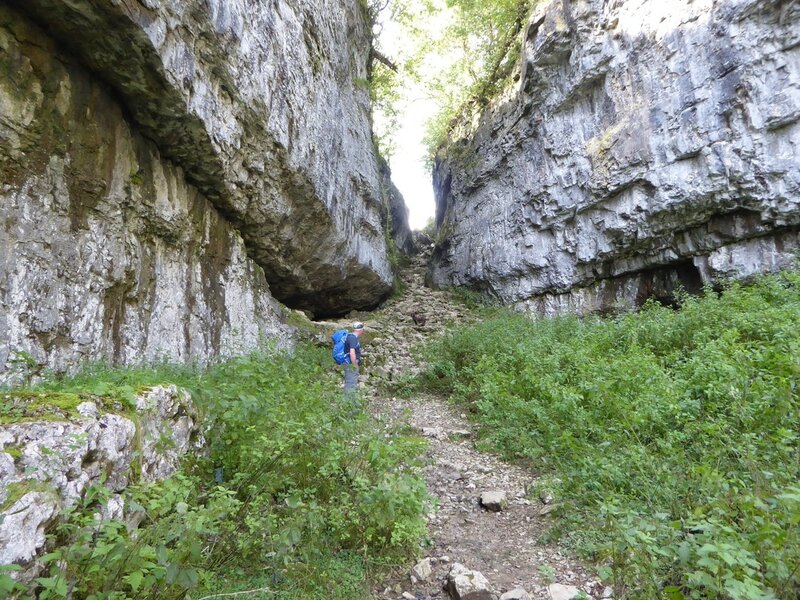 From the cave entrance the path continues and after a few hundred yards curves to the left to reveal Trow Gill - a wooded limestone ravine that is now a dry gorge. 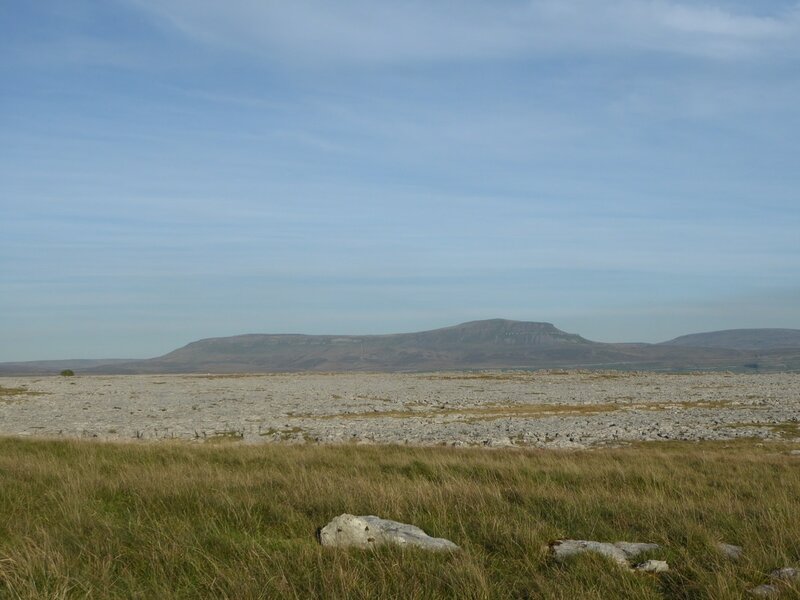 The gill was possibly once an underground cavern formed by waters which now take an alternative route through Ingleborough Cave. 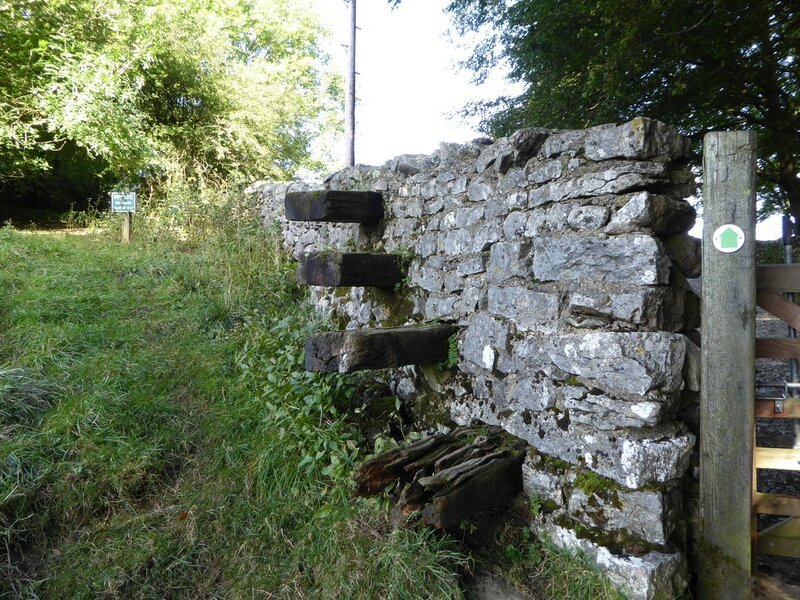 The transit of the gill is a delight - a stony and scrambly ascent through the ravine after which a wall is joined to the left which is followed to a stile. 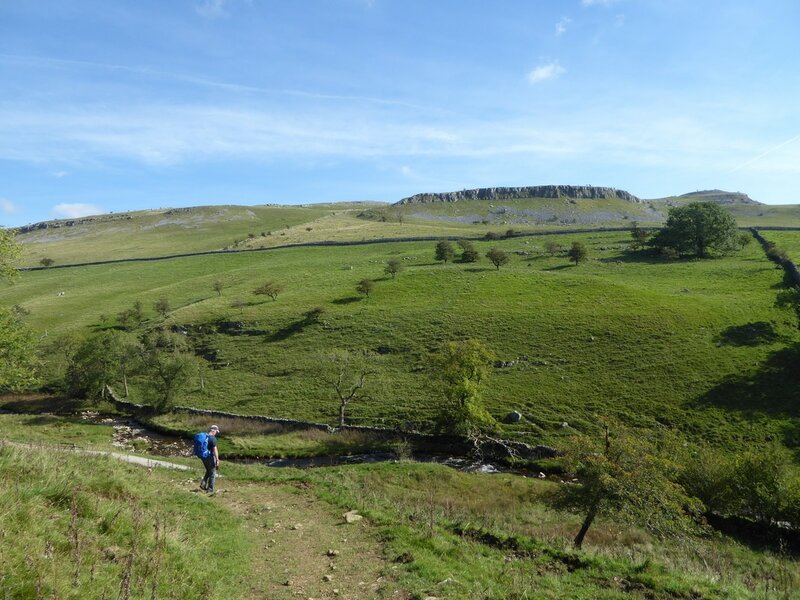 From the stile the path emerges on to open hillside and it is a short transit to a path junction where the right hand fork leads to Gaping Gill. 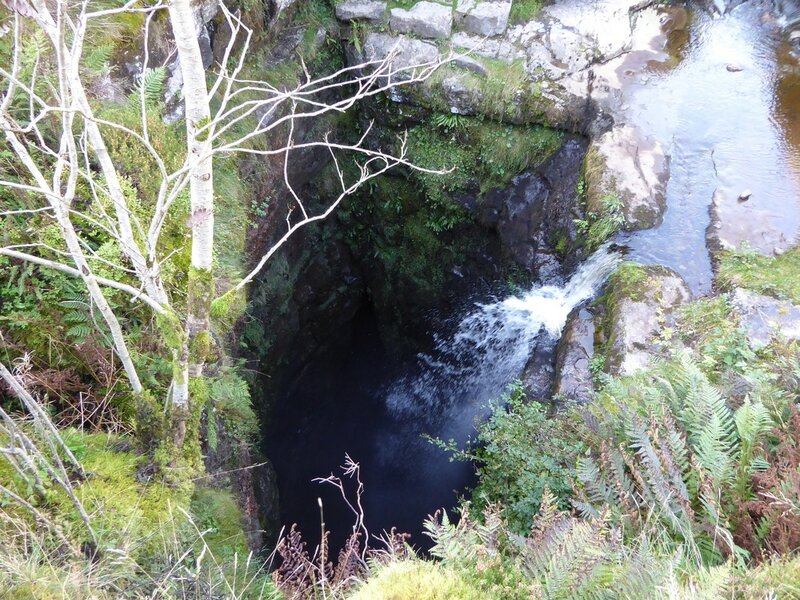 Gaping Gill is a natural cave whose chamber volume is comparable to that of York Minster. 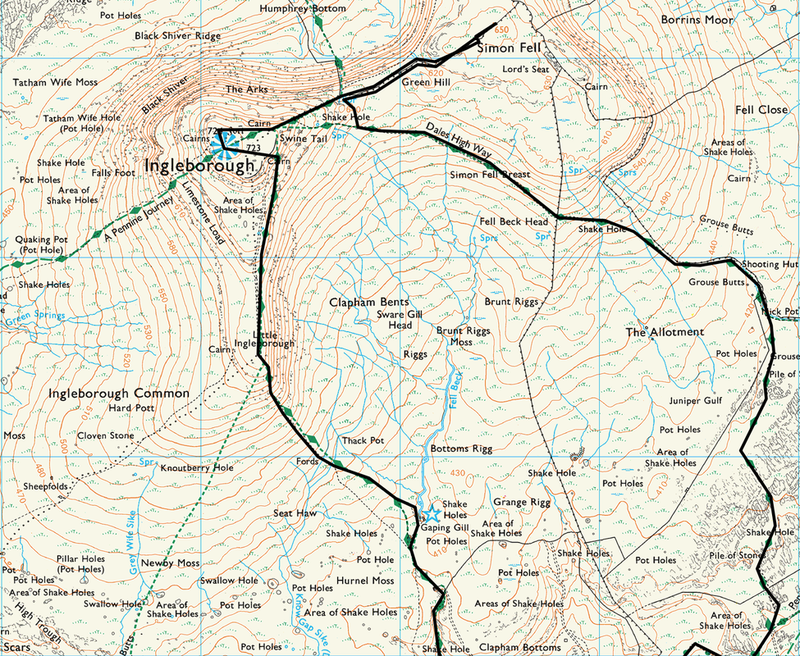 The pothole is 98 metres deep and has Fell Beck tumbling into it whose waters eventually resurge at Ingleborough Cave. 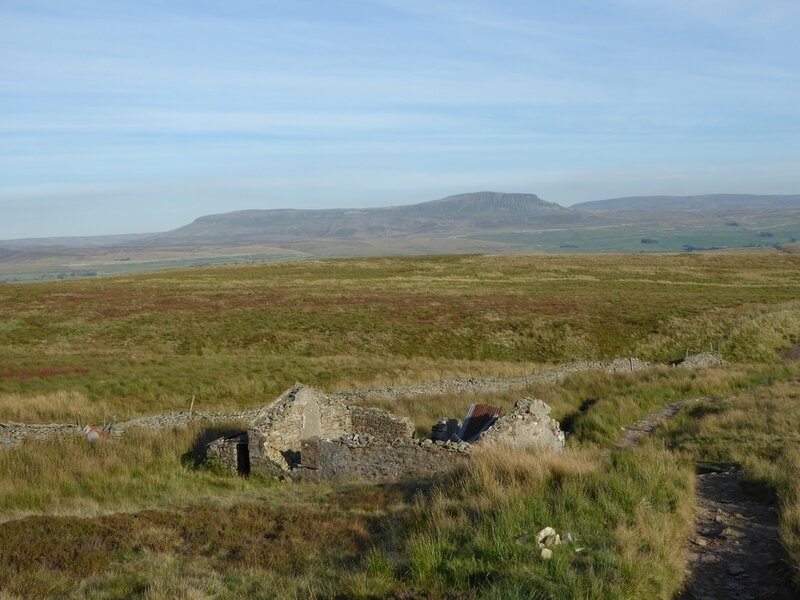 It is an idyllic spot that sits in the shadows of Ingleborough but care should be taken on and around the edges of the pothole. 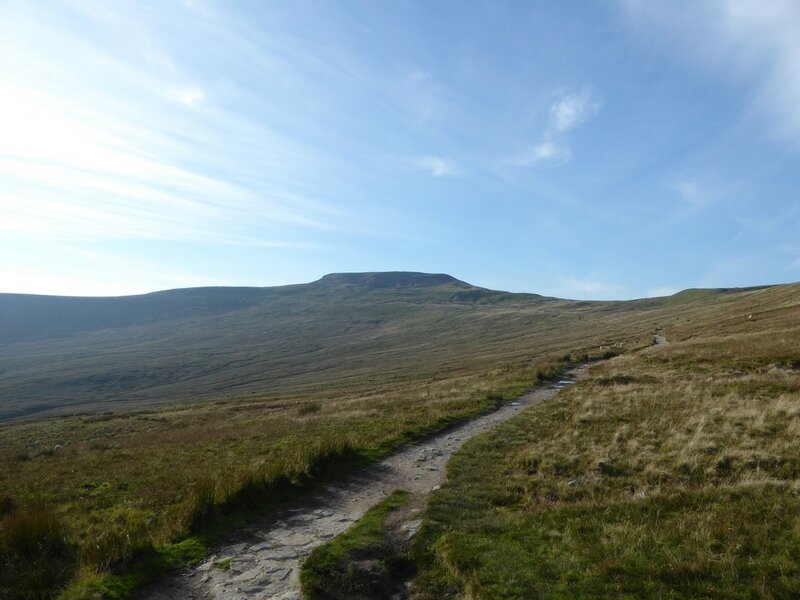 From the gill the path rejoins the main route to Ingleborough that soon becomes slabbed as it rises steeply to reach Ingleborough's subsidiary summit known as Little Ingleborough where there is a stone shelter and superb views to be had. 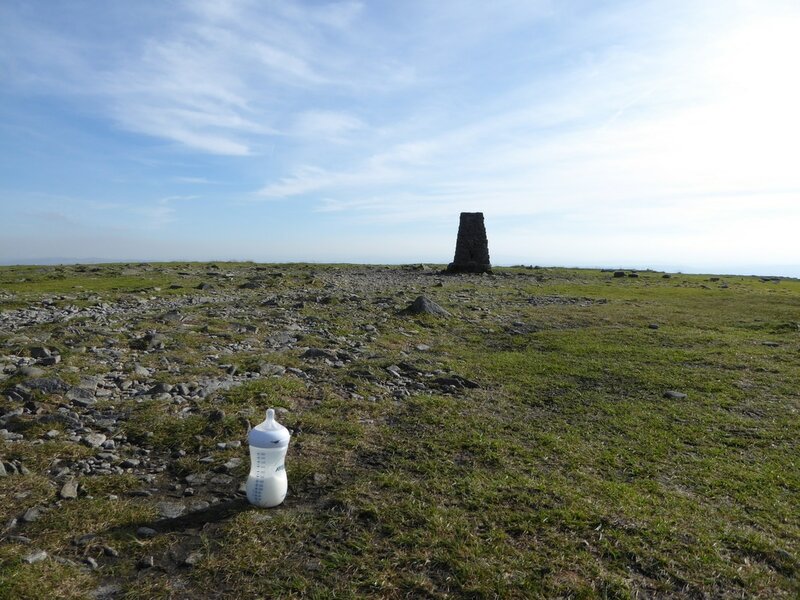 From Little Ingleborough there is now a delightful walk along the airy ridge to reach the eastern cairn from where a turn to the west gains the large plateau summit of Ingleborough, complete with Trig Point, cross shelter and several large cairns. 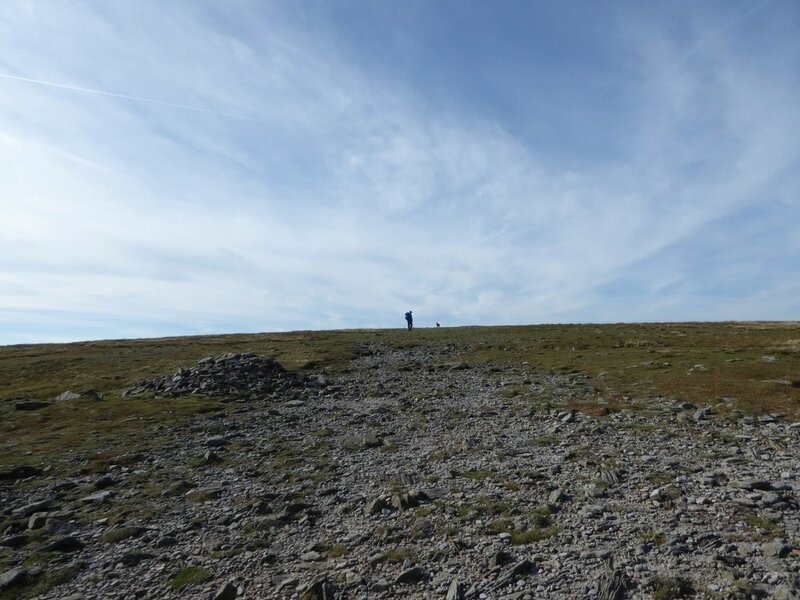 We had the summit to ourselves - it was now about 1600 and the weather was simply glorious although the temperature had dropped a few notches. 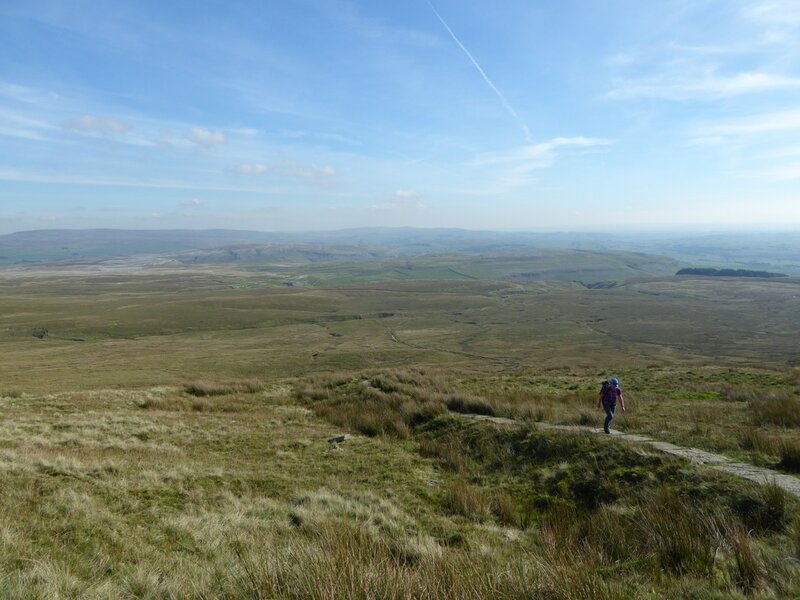 Ingleborough's top should not be left in a hurry - we had a good wander over the large expanse of the summit which gives exceptional views to Whernside & Pen-y-ghent as well as over to the Ribblehead Viaduct. 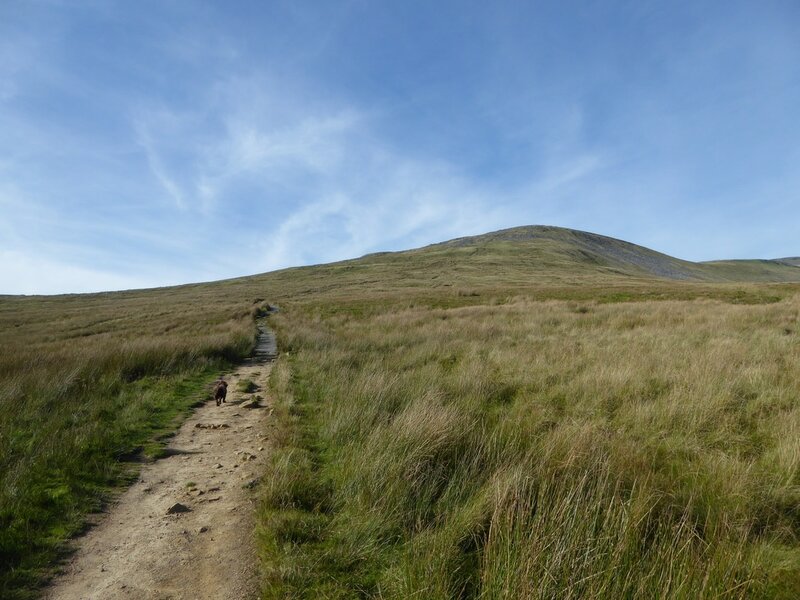 The way off followed a path called the Swine Tail - a steep, stepped descent which is the usual ascent/descent of Ingleborough when walking the Yorkshire 3 Peaks. 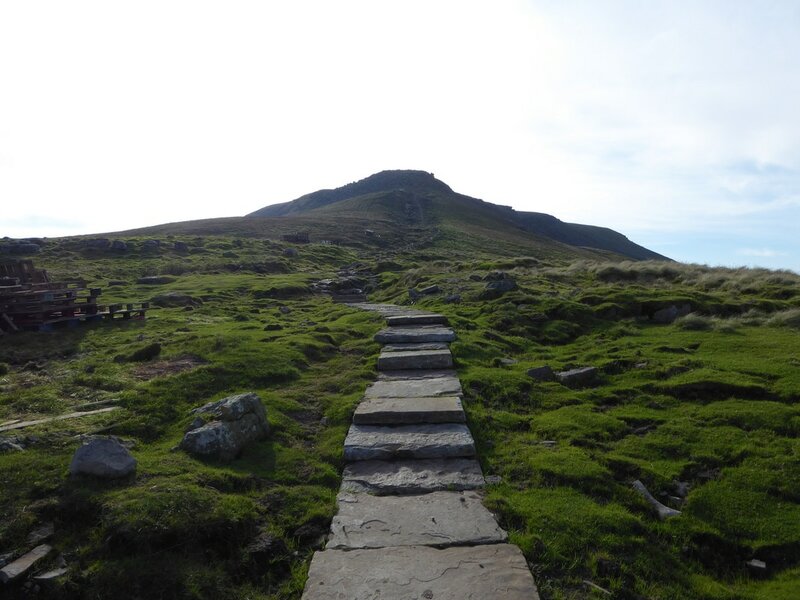 The path was undergoing some maintenance and it appeared that this was progressing well. 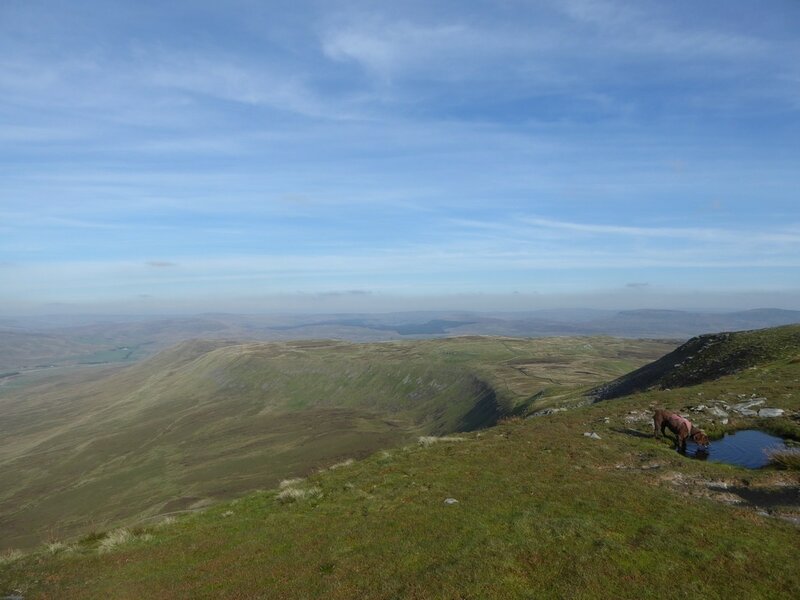 From the 3 Peaks turning coming up from Chapel le Dale we headed straight on to do a quick out and back to visit Simon Fell before rejoining the main path along the Dales High Way. 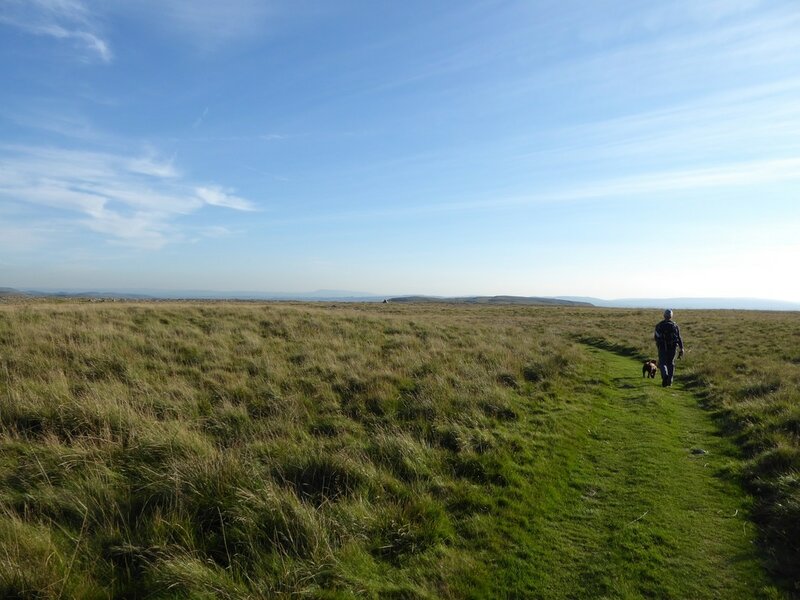 The return journey to Clapham is a long old walk but in todays evening sun was glorious. 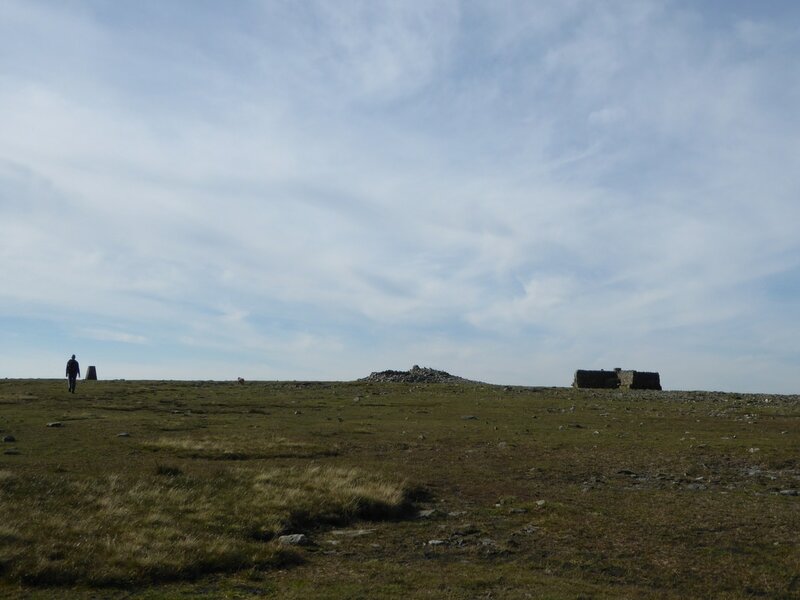 We passed the ruined Shooting Hut on The Allotment from where the path leveled out to head along the Clapham path to reach Long Scar. 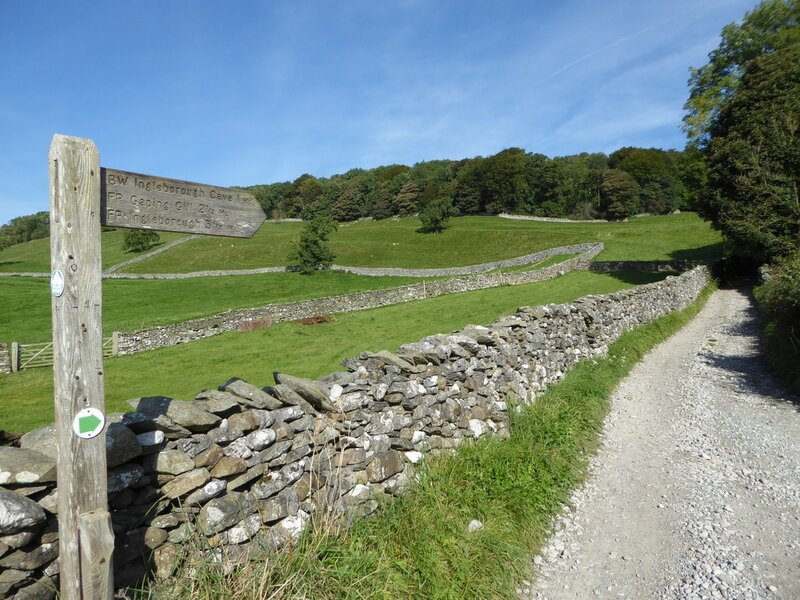 By now the path had turned into a delightful grassy swathe which stayed with us until we reached the gate leading to the track known as Long Lane. 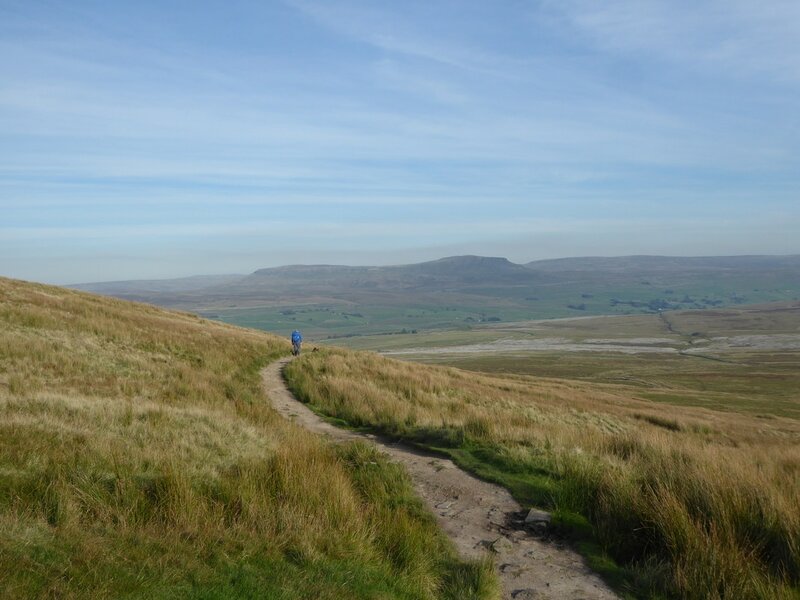 The track is followed for a couple of miles or so to reach the junction with The Pennine Journey route, eventually dropping down a steep section through tunnels to reach Clapham. 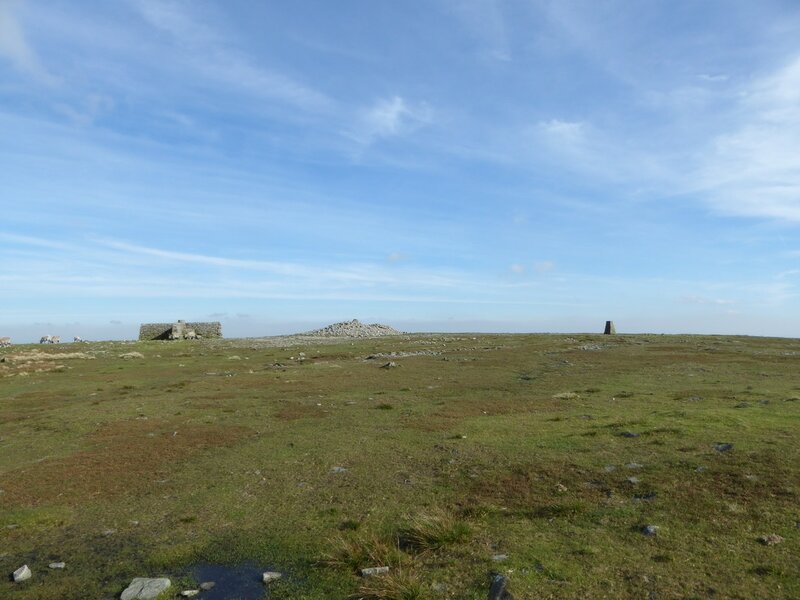 We had intended to visit the Norber Erratics but left them for another day. 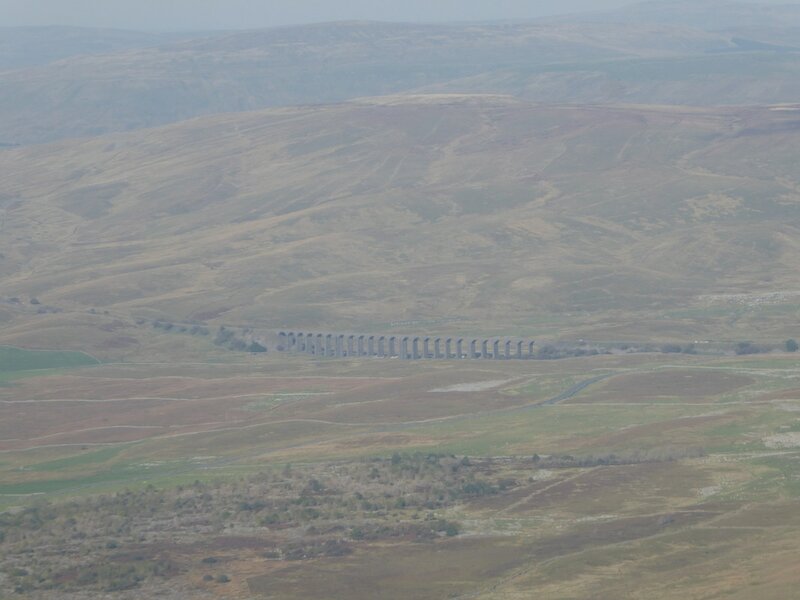 All that was left to do was to drive over to The Station Inn at Ribblehead for some liquid sustenance and a superb evening meal. 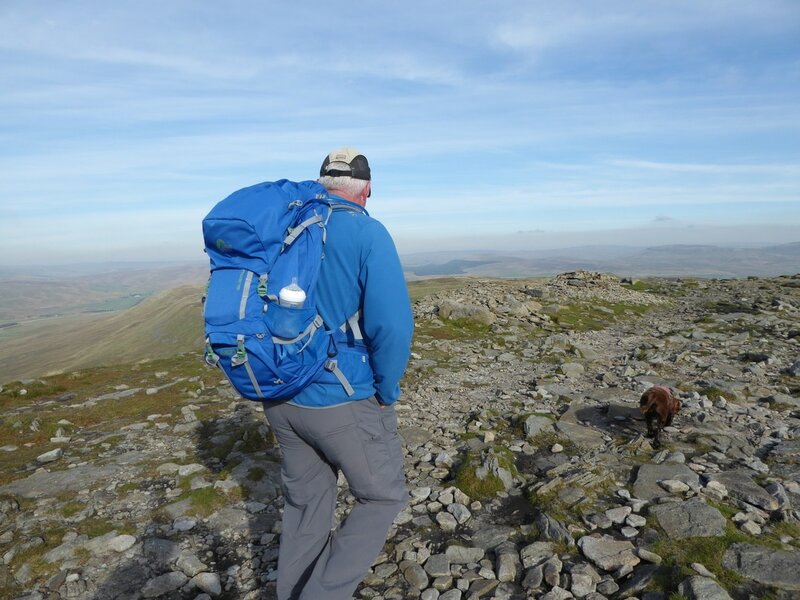 There is no doubt that todays walk is one of our favourites. We deliberately left it late in departing Clapham and enjoyed virtual solitude and only saw a handful of people all day. 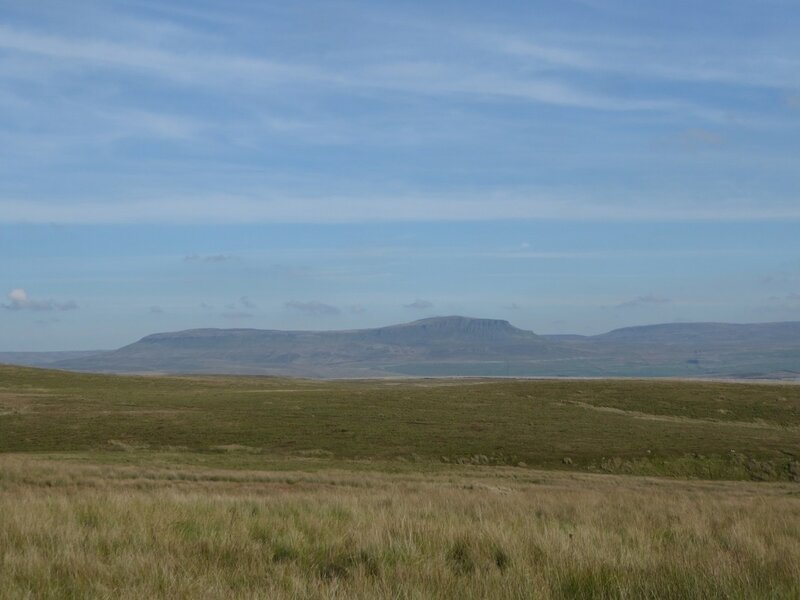 At the top of the climb out of Trow Gill we get our first view of Ingleborough. Saves me a bit of typing! 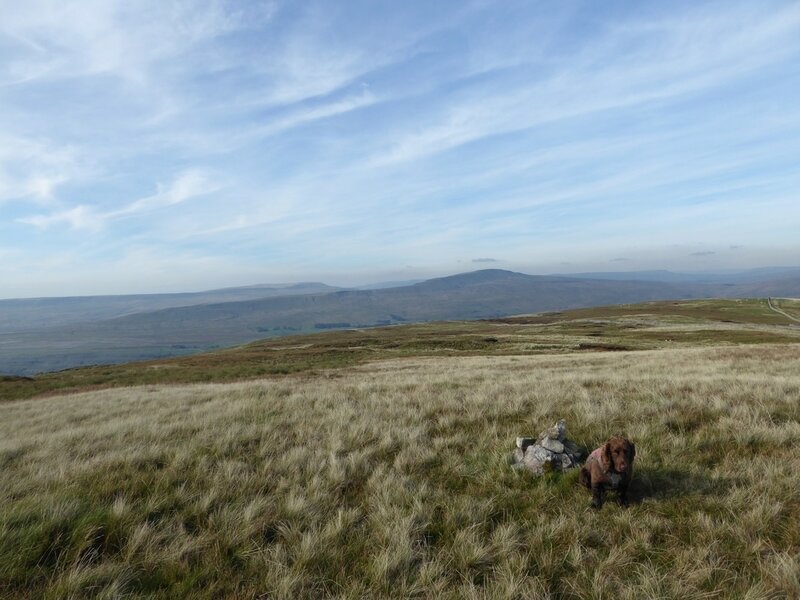 Nobody up here today - bliss. 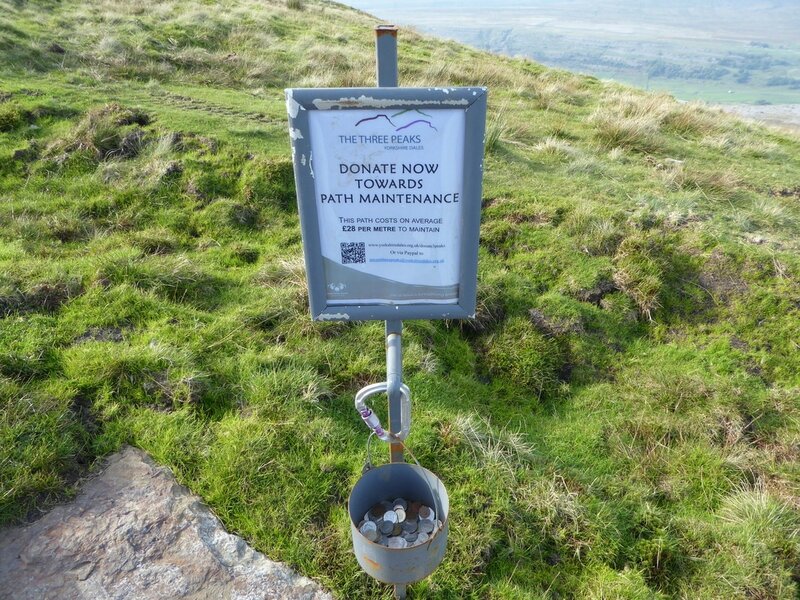 I wonder what that white thing is to the left of the cairn?